The Watermark St. Clair Shores 3-15-2019 Recap and SBD Audio UPDATE: Video too! On a rainy Friday night, we loaded into our first gig at The Watermark in St. Clair Shores. We loaded a corner in the bar with our gear and played an evening of high-energy Grateful Dead. Max debuted his new Moog Sub Phatty to great acclaim (check them out in Terrapin, Stranger and Fire), and with the help of our sound engineer, Josiah, we entertained a room full of dancing Deadheads. For our second show in a row, the excellent Nick Serocki from Deadicated sat in the Kreutzmann seat, holding it down with expertise and class. We'd had show posters made for the occasion, and signed and raffled them off, after giving one to a birthday girl in the house. We had a GRATE time and can't wait to come back! Raising The Dead performed a set of classic Grateful Dead at Trixie's Bar in Hamtramck on Saturday, March 9, 2019. Trixie's is one of many Hamtramck bars participating in the Hamtramck Music Fest, a yearly all-volunteer festival to raise money for music eduction in the Hamtramck public schools. This year, RTD was one of dozens of bands that donated their time and talent for this worthy cause. The bill at Trixie's included Dead People laying down some tasty alt-country licks, John Salvage's solo electric looper jams, and trombone-flavored rock and roll from Slizz. Fitting our 5-piece band on the stage was like a game of Tetris, but we simplified our setup and got in close. We began our set after midnight, concluding just before 1:30. The set featured our debuts of Cryprical Envelopment and He's Gone, and featured the formidible drumming talents of Nick Sercoki, on loan from Deadicated. The crowd at midnight included an excited contingent of Deadheads, obviously excited to sing along to their favorite band. Their appreciation was obvious and really fueled us as we jammed. Raising The Dead is playing two big shows in March - At Trixie's in Hamtramck on the 9th and the Watermark Bar and Grille in St. Clair Shores on the 15th. We are excited to announce that we will be joined at both gigs by drummer Nick Serocki, on loan from Deadicated. His percussionist partner Josh Sehn will also join us at the Watermark! We can't wait to share the groove with them, and especially to have our first 2-drummer show March 15th. 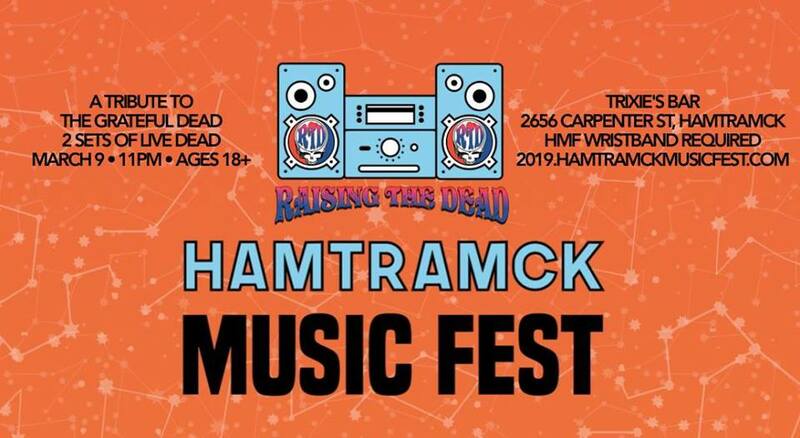 The Trixie's gig on March 9 is part of the 4-day Hamtramck Music Festival, where one $15 wristband gives you admission to dozens of shows, and the proceeds go to benefit the Hamtramck Public Schools Music Program. No cash will be accepted at the door, you must have a wristband. Here's how to get yours. 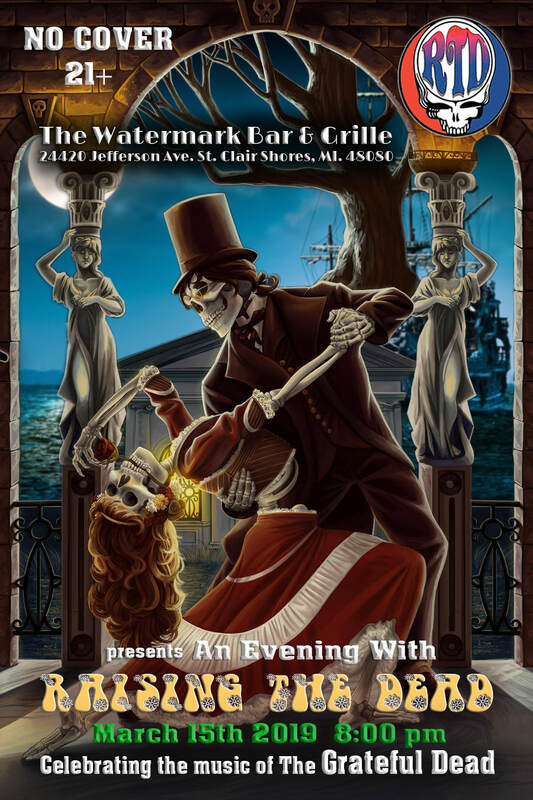 The Watermark is a beautiful venue overlooking Lake St. Clair, and they hope to make it a premiere destination for great music. Raising The Dead has the chance to be one of their core acts, but we need you to come out and see us! Expect the songs you know and love and some great jams in our own virtuoso style, held together by Deadicated's Double-Drummer Duo. It's the place to be - see you there! 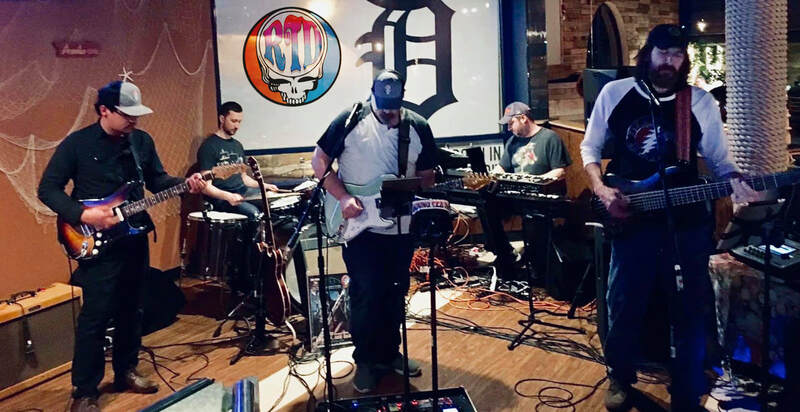 On Saturday, February 16, 2019, Raising The Dead took the stage at Larkin's Bar and Grill in Westland, MI, and we brought the best American rock and roll has to offer with us. Playing for a crowd of both appreciative regulars and expectant Deadheads, we worked through 180 minutes of jam rock bliss. It was a special occasion, as we welcomed back our original drummer, TW Coleman, to hold the Kreutzmann seat for the evening. He helped navigate us through a ton of double-digit jams, including Althea, Scarlet>Fire and China>Rider, and epic versions of Playin' in the Band>Uncle John's Band>Playin' In The Band and Eyes of the World. For the first time in a RTD gig, Jake brought out his slide - catch his tasty playing in our Set III closer, The Wheel. Thanks to all the fans (especially the Home Shopping Network) who made it out for the gig. Iy you missed it or want to relive it, you can check out the full-show soundboard audio below, and expect our favorite jams on our YouTube and Facebook pages soon! Join Raising The Dead as we perform at Larkin's Bar in Westland on February 16! We'll be playing an evening of Grateful Dead, with plenty of room for shakin' your bones. RSVP on Facebook. Raising the Dead was testing out some new equipment and went LIVE to Facebook from our rehearsal on January 6, 2019. We did a short set of Grateful Dead tunes including a rockers Jack Straw and Promised Land, a spacey jam-filled Cassidy, high-energy blues tunes Deal and US Blues, and the towering composition Terrapin Station. We plan to fill more of the days between gigs with more virtual concerts like this one. Enjoy! 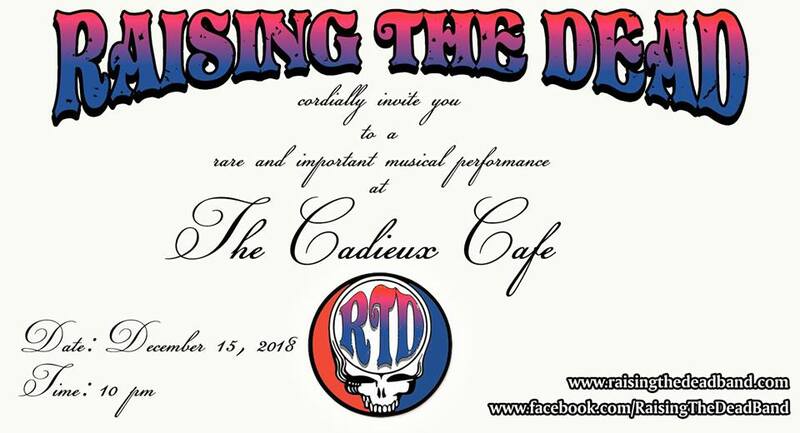 On Saturday, December 15, Raising The Dead returned to the Cadieux Cafe to perform an ambitious set featuring 10 song debuts, Dagwood-sized song sandwiches, extended jams, and some of our best playing to date. This was the first show played with Max's new Hammond organ, and you can hear it shine throughout the set. The setlist featured two signature Dead song splits - Sugar Magnolia was cut short with a segue into Big River, only to return at the end of the set with Sunshine Daydream. After our setbreak, Playin' In The Band shifted from it's signature jam and segued unfinished into Bertha. We picked up the end of Playin' after Eyes of the World, which featured the often unplayed Coda section of the song. We were also excited to debut three fan favorite song segues: Weather Report>Let It Grow, Lost Sailor>Saint of Circumstance (a top contender for the night's audience favorite), and Dark Star>St. Stephen>William Tell Bridge>The Eleven. We had even planned to debut two more songs we didn't have time to perform! If it's not obvious by now, we really enjoy tackling the toughest tunes in the Dead database, and we're thrilled with both the audience reaction and the musical result. Listen for yourself below! Set II: Playin In The Band>Bertha, Dark Star*>St. Stephen*>The Eleven*>Candyman, Lost Sailor*>Saint of Circumstance*, Eyes of the World (with Coda*)>Playin' Reprise. We've been rehearsing a lot in anticipation of our return to Cadieux Cafe. Expect a bunch of song debuts, including some of the most iconic and beloved tunes from the Dead's catalog. Come for the music, the scene, the dancing, the vibe, the family, and the fun! See you Saturday. RSVP on Facebook. Those Raising The Deadheads who also follow the band Phish are aware of their tradition of covering complete albums on Halloween. This year, they performed an obscure 1981 album by a Swedish band - that never really existed. Adding to the hijinks, RTD's Dave Martin recreated one song from this set as he imagined it might have sounded in 1981. The recording of "Death Don't Hurt Very Long" went viral among Phish fans, racking up 5k views in 2 days. Now, Relix Magazine has reported on Dave's cover and another recorded by a California musician. Here's Dave's recording, played almost entirely on a Yamaha SHS-10 Keytar. In rehearsal on Sunday, November 11th, we decided to go live to Facebook with a performance of some Grateful Dead songs. Here's the full video, now enhanced with a soundboard audio mix. Enjoy, and see you December 15 at Cadieux Cafe!